Turning MDM Subjectivity into Objectivity. Every auditor faces different challenges. Some of us get stuck on MIPS, while others struggle with modifiers and time-based codes. 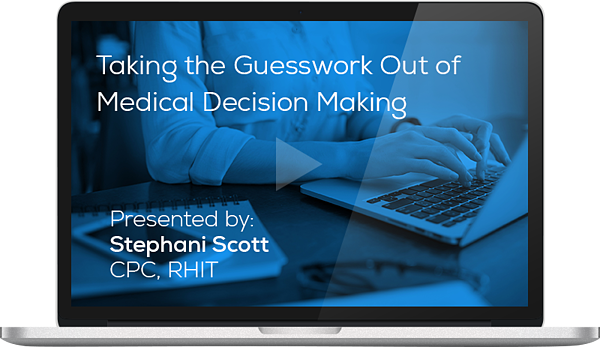 The one area that seems to really stump us all, across the board, is Medical Decision Making (MDM). It’s that one area where there’s always room to grow as an auditor. MDM is one of the most challenging areas of Evaluation and Management auditing. It requires the auditor to understand the clinical cognitive labor of the physician, which, let’s be honest, often leaves us questioning the MDM complexity. PLEASE NOTE: This program meets AAPC guidelines for 1.0 CEU. Can be split between Core A, CPCO, CPMA, CEMC, CRC, CDEC and CPC. You will receive your CEU in a separate email after watching the on-demand recording.